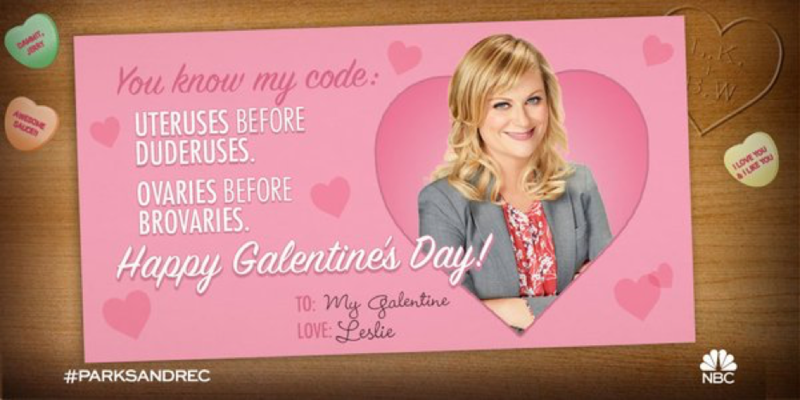 Which Valentine's Day Marketing Campaigns and Channels Really Work? Love is in the air – and on the internet. From couples to singles, many people are looking for unique ways to celebrate Valentine’s Day. With the rise of online businesses and digital consumerism, Valentine’s Day marketing campaigns present a prime opportunity for brands to boost awareness, enhance customer loyalty, and drive revenue. In 2017, consumers spent an incredible $19.5 million on the event, an average of $146 per person. Likewise, publishers and content creators can also create interesting Valentine’s Day content to capitalize on social buzz and set the stage for more content consumption after the holiday. So what kind of content gets the most engagement from the Valentine’s Day audience? We analyzed over 4.4 million social signals (including shares, searches, and social referrals) around Valentine’s Day content published last year to uncover interesting Sharing Intelligence insights. Based on our 2017 Valentine’s Day data, social sharing spiked on V-Day, especially on Pinterest. 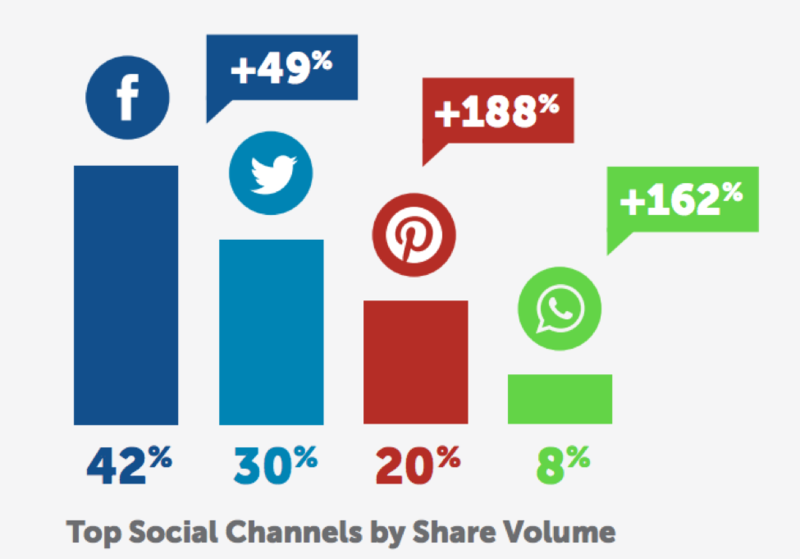 When compared to the general audience, Valentine’s sharers are 188% more likely to share on Pinterest, 162% more likely to share on WhatsApp, and 49% more likely to share on Facebook. Considering that Pinterest is the preferred channel for Valentine’s Day sharers, brands, and content creators can boost their Valentine’s Day marketing strategy by making it easy for followers to save photos, videos, and photos onto Pinterest boards via the Pinterest Share Button. In terms of browsing behavior, our data shows that users who shared on Valentine’s Day were 41% more likely to share on mobile devices. Therefore, make sure that all of your Valentine’s Day marketing campaigns and materials are mobile-optimized, or you may lose some valuable engagement. You might be wondering: other than an interest in Valentine’s Day festivities, what other content topics are these sharers engaging with? Our data around passion points shows that Valentine’s Day sharers were 549% more likely to share party games than the general audience year-round. In 2017, ShareThis captured an average of 1.2 million shares to Pinterest each month globally. But in February, Pinterest snagged over 2 million shares, smashing the monthly average. Since Pinterest is a top-performing social channel around this holiday, it’s a good idea to optimize this platform for your Valentine’s Day marketing campaigns. Not surprisingly, share volume around Romance Films experienced the highest growth during V-Day and the weekend leading up to it (about 32-57% daily growth). Surprisingly, share volume around Thriller, Crime, & Mystery films also experienced a growth on the Sunday before Valentine’s Day and the actual day of the event (18-23% daily growth). Share volume around Gifts, Flowers, and Gourmet & Specialty Foods experienced steady growth (5%-21%) throughout the three days leading up to V-Day, but share volume significantly dropped on the day of the event. Users continued to share content related to Cards & Greetings starting from the three days leading up to the event and until the day of the event (3-14% daily growth). As you can see, both the content and timing of posts matter for audience engagement. To tap into the sharing frenzy and become part of viral conversations, publishers and brands should hone in on these top categories and post relevant content at the optimal time to appeal to their target audience. If you’re encouraging gift purchases from partners or advertisers, focus on older millennial men. 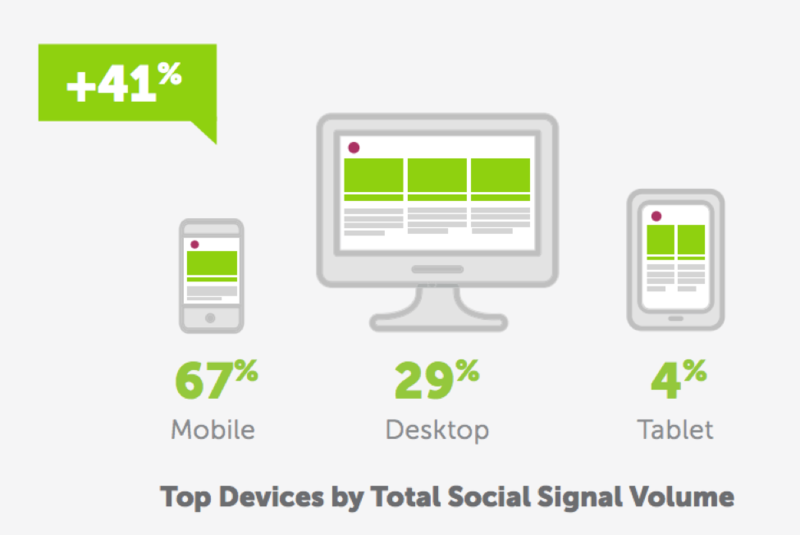 ShareThis data shows that men make up 53% of social media activity on Valentine’s Day. 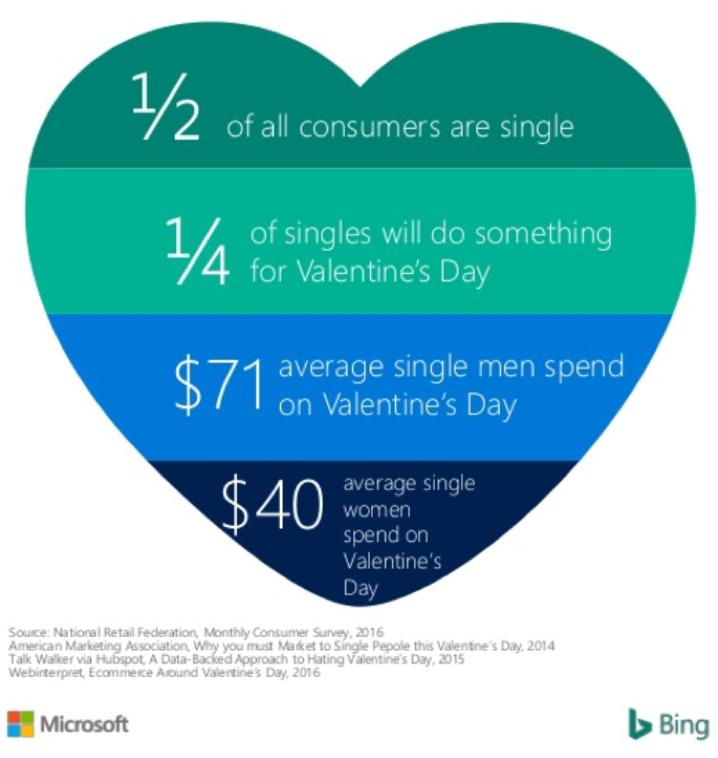 Bing found that on average, they spend twice as much as women. Additionally, consumers aged 25-34 generate the most social activity (more than 25%) and purchases (about $234 per person). You may also consider promoting content related to gifts for pets. While it may seem counter-intuitive, Bing found that in 2016, 19% of consumers bought gifts for their pets. They spent $681 million total, averaging $26 each shopper. Create Pinterest boards with these topics in mind. Experiment with different versions of titles that appeal to people’s needs for shopping and spending quality time with friends and loved ones. Consider boards like Gifts for Her, Gifts for Him, Galentine’s Day, Valentine’s Day: Friend Edition, or Be Your Own Valentine. Consider working with influencers on Pinterest to craft visually appealing boards that showcase your brand and products in the best light. In fact, Pinterest encourages such partnership — its Pin Collective program matches brands and content creators to leverage the power of micro-influencers on Pinterest. Examining activity around Valentine’s Day specifically is a powerful way to generate positive results from your efforts. But don’t forget to look at overall data trends throughout the year for a more holistic view of Pinterest’s strengths and opportunities. If you’re planning to target Pinterest specifically, consider incorporating these topics whenever you can. For more granular insights to complement our research, you can check out the Pinterest 100 insights by Pinterest, which covers 100 global trend predictions across its top categories. Curious which countries are more active on Pinterest? The following countries are more likely to share to Pinterest than the global average, so keep this in mind for your global campaigns. 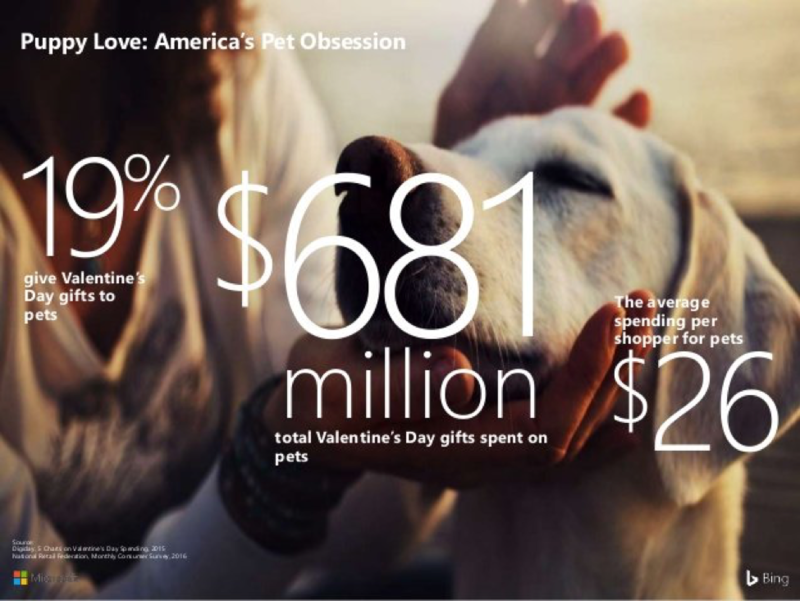 Publishers and marketers looking to drive traffic and hit their revenue goals through 2018 Valentine’s Day campaigns should dig into key data points around online social behaviors. We hope our insights and social media buttons including the Pinterest Share Button can help you drive massive traffic, promote your business, and win over new readers and customers.